SHAWNEE—Oklahoma Baptist University (OBU) athletics claimed a successful weekend, March 7-8, as the OBU women’s track team collected its third-consecutive NAIA Indoor Track and Field Championship and the men’s and women’s swimming and diving teams captured the NAIA Swimming and Diving National Championships. Oklahoma City Community College hosted the swimming and diving championships. The track and field meets were in Geneva, Ohio. A total of 44 OBU male and female athletes received All-America honors among the track and aquatic sports. 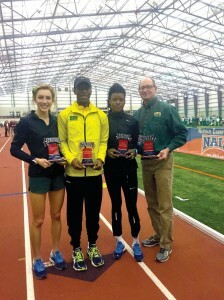 Seven Bison track athletes earn 11 All-America honors while 13 Lady Bison captured 13 awards. Ten Lady Bison swimmers were crowned All-America in 38 events as they won their third-consecutive national title. Bison men captured All-American status in 38 events, with 14 swimmers taking home the honors, and have won four consecutive national championships dating back to the inception of the program in 2011-12. Ford Mastin earned his 11th NAIA Coach of the Year award. Elizabeth Dadzie won the Most Valuable Performer Award, and Hannah Fields and Travis Hinton captured the Outstanding Performer Awards. 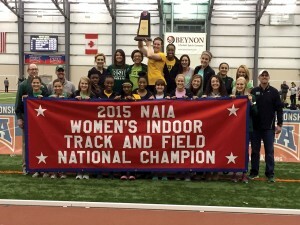 This is OBU’s seventh women’s indoor team championship. The Lady Bison also won it all in 2005, 2007, 2010, 2011, 2013 and 2014. From left, Women’s Outstanding Performer Hannah Fields; Men’s Outstanding Performer Travis Hinton; Women’s Most Valuable Performer Elizabeth Dadzie and Women’s Coach of the Year Ford Mastin. Laura Galarza shared the honor of 2015 Women’s Swimmers of the Year with Biola (Calif.) University’s Christine Tixier. Galarza also earned Women’s Swim of the Meet honors. Daniel Ramirez is the 2015 Men’s Swimmer of the Year, as well as winning Swim of the Meet. Kristen Brimage is the Women’s Diver of the Year, while Zak Rowton was named Men’s Diver of the Year. Bison head coach Sam Freas was named both the Men’s and Women’s NAIA Coach of the Year. At the National Track Meet, Fields won the mile with an NAIA record, won the 3000 meters and anchored the national champion distance medley relay and 4×800 relay teams. Hinton shattered the NAIA record in winning the 600 meters and ran the first leg of the NAIA champion 4×800 relay. Another track highlight was Fields winning the mile in NAIA-record time at 4:37.25, eclipsing Leah Pell’s 1988 mark of 4:43.68. Pells represented Canada in the London Olympics. Fernando Morillas highlighted OBU men’s swimming, setting a new NAIA National Championship record in the Men’s 200-Yard Breaststroke at 1:56.96, shattering the previous record set by former Bison Gregory Penny by more than two seconds. These were the final NAIA events for OBU, as the Bison will transition to NCAA Division II.